My name is David Ruyet. I was born in Barcelona in 1970, and I moved to Buenos Aires in 2012, where I currently live. I have almost 20 years of professional experience solving problems in the energy sector. That is my job: I SOLVE PROBLEMS. I am especially focused in renewable energy. I was very lucky since my first job was managing this wind farm in 1996. Today it seems very small: 6 turbines and 590 kW. When it was installed -1991- it was equal to the 10% ot total wind capacity in Spain. I am proudly graduated as industrial engineer in a public university (the UPC, and my engineering speciality is nuclear energy). Before, I had left my degree in Physics in the fourth year; I realized it was too theoretical for me. I like being on the ground. Ten years after my engineering graduation, I rounded out my education with an MBA at ESADE Business School. It was the right time to do it. Fingers crossed, I am also about to present my dissertation to receive a doctorate degree in economy at the Ramon Llull University. Currently, I started my own personal business project: I am leading a challenging engineering company, ENERGIAS DEL PLATA, and one year one we are already working with some of the most relevant agents in the renewable energy sector en Argentina. It was almost necessary, after almost 10 years in the Spanish business group of construction and services GRUPO SANJOSE, where I have worked leading the energy business and reporting directly to its Chairman. Previously, my professional career was also devoted to energy matters: as Technical Director in Barcelona Energy Agency, dealing with energy issues in the City council of Barcelona (till 2007); previously, and where I started to work, I worked for ENDESA during almost 10 years, always dealing within the energy business, and where I took the chance to deal with solar, biomass and wind energy projects, when only pioneers and fools worked on them. Putting too much effort I have developed a motivational academic career in parallel to my professional one. I started in 2001 at Institut Químic de Sarrià, and before moving to Argentina I was Associated Professor within the Department of Industrial Engineering teaching different technical subjects such as “Electrical technology”, “Distributed Generation” and “Architecture and industrial construction”. 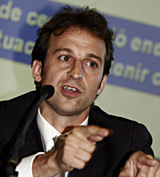 I was also coordinator of the Programme in energy saving and rational use of energy IQS-ENDESA till 2012. I am also academic collaborator within the Business Policies Department at ESADE Business School, being responsible for “Sustainable Business” subject included in the MBA Programmes from 2009. Currently, I collaborate as visiting professor at ORT in Uruguay, as lecturer of the subject “Enterprise, Society and Ethics” in MBA Programs. Since I love teaching, I never was able to refuse to collaborate as visiting professor in different postgraduate programmes (UIB, UAB, ICAB, IAE Business School, EUETIB) and Ph.D. Programs (University of Oviedo), always focused on energy and environmental issues, taking into account a holistic vision: technical, economic, social and managerial. And why blogging? The main aim of blogging at www.davidruyet.net is simply sharing opinions about current topics relating to energy, environment and economy. felicidades por este blog !! Me ha sorprendido muy gratamente este blog. Enhorabuena. Por cierto, fui uno de los asistentes a la sesión formativa que diste en Foment y quería agradecerte tus interesantes explicaciones. Me me decepcionó un poco saber el limitado alcance que aún tienen a día de hoy las renovables, esperemos que en un futuro (no excesivamente lejano) la cosa mejore. Avui he llegit altres coses que no són els posts. Me gusta mucho tu blog y tu forma de escribir. Espero que sigas haciéndolo por mucho tiempo. No coneixia el teu blog i arribaré tard a la feina. Molt bo!!! què hi ha que tu no sàpigues…..